Changing how we eat can be a challenge; most people eat habitually, the same meals week in, week out so stepping out of that groove can feel an effort. But here is something to ask yourself... is the food you are eating giving you short term pleasure or is it aimed at long term leisure? Short term pleasure food includes ready meals, processed foods, sugary snacks, processed carb snacks like crisps, food that makes us feel better in the moment by dampening down our emotions, food that is our 'friend', food that we crave, food that gives us a quick burst of energy. Long term leisure food includes home cooked meals, fresh fruit and vegetables, locally produced food, nutrient-dense food, food that gives us sustainable energy, food our great grandparents would recognise, food without an ingredients label, food from the ground. Now we don't have to be perfect, there is nothing wrong with a glass of wine on a Saturday night and a dessert when eating out, it is just about getting the balance right. I advocate the 80/20 rule with my clients, so 80% or more long term leisure food and 20% or less short term pleasure food. By doing this we are supporting our body enough so we can get the best out of this life and our body for the long term. 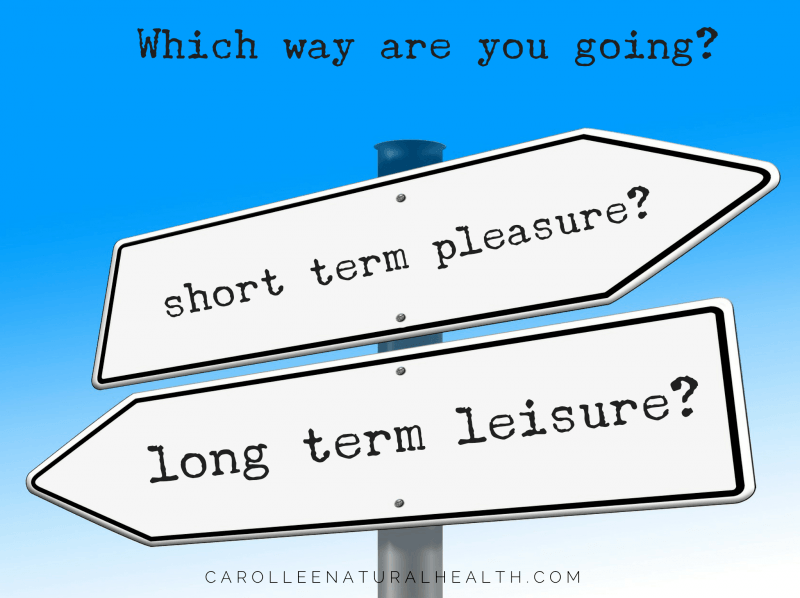 So how can you add-in more 'long term leisure' foods?